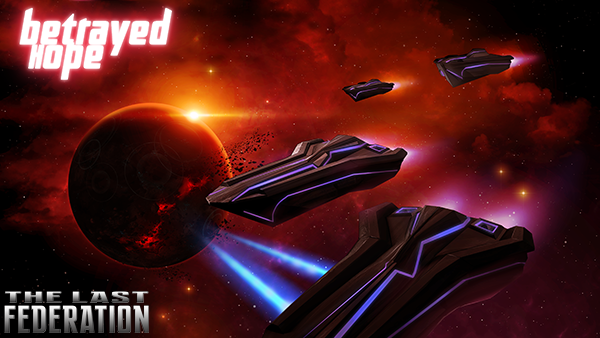 The next chapter in The Last Federation's saga. If you're familiar with the expansion model for AI War: Fleet Command, you know the general idea here, although we also have some cool new tricks up our sleeve this time around. Free updates to the base game have been thick on the ground since TLF's release a month ago, and we're going to continue with updates to the base game for a long time to come (not always at the breakneck pace we've had so far, but that's been true of AI War over the last 5 years, too). As with AI War's expansion, TLF's expansions will always be completely optional and just for the fans who want more of what they already love in an expanded universe. We never charge for bugfixes, balance updates, usability improvements, or so on -- that would be ludicrous. Anyway, we're really excited about both where the base game is heading on its own, and about what this new expansion will bring to the table on top of that. Stay tuned! Update on the schedule: For the TLF expansion, that's going to be very late July or early August when we start the beta for that. Aiming for a September 2.0. That schedule has been pushed back so that I could work on the Linux ports and our site and so on, since we have some breathing room right now. There are going to be a few more goodies packed into TLF 2.0 than I originally planned, too, so that's a bonus for you for your patience. What, no teasing the expansion's content beyond the title? You cruel, cruel man. EDIT: What are these? Speedboats in space ? Nevermind me. I am just excited! The picture looks like a ray hitting the planet and shattering it. Star Wars IV was subtitled "A New Hope." The expansion is title "Betrayed Hope." Ergo, the only logical conclusion from the limited information in this announcement is that Chris has sold Arcen games to Disney. And the expansion will bring Jar Jar Binks to support the Hydra in some sort of Federation senate. A betrayed hope, indeed. Dang, got it in one! Just take these rupees, okay? It's a secret to everybody. aaahhh, you are killing me!!! Can't wait for the new stuff !! Great reason to replay the game once I finish my current play through! All these crappy triple a companies could learn something from Arcen!!! I hope you also do alpha player testing on expansions if you are adding new features so we can help with bugs and balance. Oh you bet we will. Same as we do with AI War expansions. I'm not sure exactly the logistics on that yet, but usually we make it available for direct purchase early on our site, and then people who purchase it can give all the feedback they like, and then also we will send a steam key to those folks once we fully launch the expansion. Something along those lines, anyhow. We have separate processes for the expansion development and main game development, just habits that we've built up over time. I'm thrilled that the game has been successful enough to warrant an expansion. Here's to many more to follow! I always think they're good names though. Were it up to me, the expansion would just be named "MORE EXPLODE" or something. Not as good with the naming bits. Also..... no detail? Really? Whyyyyyyyyy? And obviously you can count me in for testing and whatnot, whenever that happens. Should be interesting. Quick question since I know you guys are often pretty open about these things but did TLF really sell that well? I know the other games either failed to generate expansions or at least took more time in between as with AVWW (sequel in this case and the reason for it and the reason for the delay seem to have more to do with trying to fix the original game leading to two fragmented ideas becoming two separate games). And then one other question, do you feel that this game has been received particularly well? From what limited information I've seen it seems like this game was a bit controversial for many players where as Bionic Dues was received more warmly overall but probably garnered less sales. Anyways, just curious and love hearing about the company as a big fan, good luck! This game has sold the best out of any title we've ever done, in terms of the timeframe that has elapsed so far. Far, far and away the best. It's currently already up to something like 1/4 the amount of total income that AI War and all of its expansions have generated over the last 5 years, but in only the span of a month. We're within a few weeks of breaking even on the project, although since we've been doing so much post-release support that causes the costs to rise and thus both the expansion and ongoing sales help to offset that. The reception to this title has been great -- it's one of our least-controversial titles ever, frankly. It current is tied for our second-best metascore behind AI War (tied with Tidalis). Those being our only three green metascores, although metascores really aren't representative of the wider audience. But we've had very positive endorsements from a lot of heavy hitters, such as Total Biscuit. Looking at the steam reviews on our steam page, there's one unhappy guy at the top who played early versions and was frustrated, and that's his prerogative. Then there's pages and pages of super happy customers before you get to the next negative customer review.